If you love makeup, there probably was a time when you were torn between many different makeup options for the same purpose. For instance, when we talk about face coverage, you have the option to use BB cream or foundation. And if you are not a professional makeup artist, it can be hard to decide which one to get (as you won’t always be able to pinpoint the difference between the two products just by looking at the packaging). In this article, we will discuss the difference between BB cream and foundation to help you decide which to get the next time you shop for makeup! BB cream, also known as “beauty balm,” “blemish balm,” or “blemish base,” is a beauty product for the face. Its primary purpose is to even out the skin tone without the heaviness of foundation. It has a light formula and provides light to medium coverage. BB cream was originally derived from a formulation created by Dr. Christine Schrammek in the 1960s in Germany as a product to protect her patients’ skin after facial treatments and surgery. However, it was only a few years ago when it boomed to popularity in East Asia, where it started as a beauty fad that spread quickly to Europe, America, and the rest of the world because of its numerous benefits. Because it was mainly developed by Asian cosmetic companies to match the skin of their East Asian customers, there are only a few shades of BB cream available. Most BB creams available today do more than just making your skin look beautiful. Most brands make all-in-one BB cream with built-in primer, facial serum, moisturizer, foundation, concealer, sunscreen, anti-aging properties, and anti-inflammatory properties. This means that BB cream conceals your discolored spots and takes care of your skin at the same time. It does well at hiding and treating some skin conditions like pimples and rashes. Although it is called BB “cream,” it is also available in a stick form. Whatever its form, BB cream is best when applied to the skin by using the fingers. The natural heat in your fingers allows the BB cream to oxidize and blend with your skin, giving you that fresh, natural look. Foundation, on the other hand, is a cosmetic product for the face and the body. Its chief purpose is to make the skin look and feel smooth and even by hiding the blemishes and blotchiness. It has a thick consistency and generally offers full coverage. Foundation is purely foundation. This means that you have to use a different product to prime, moisturize, and protect your face from the sun. It has, however, different varieties in terms of shade (lightest to darkest), coverage (medium to full coverage), and formula (light to heavy formula). It is available in liquid, cake, or stick form. Foundation is typically applied with a makeup sponge or a foundation brush, but many artists and makeup enthusiasts also prefer using an airbrush tool or the fingers (but streaks and fingermarks may be visible, especially with thicker foundation). The first foundation was called “Pan-Cake” and was created by Max Factor in the 1930s. Nowadays, the foundation is used as an everyday makeup and as professional makeup by performers. What, then, is the difference between BB cream and foundation? BB cream is an all-in-one product. It evens out your skin tone and has built-in primer, moisturizer, SPF, anti-wrinkling, and anti-inflammatory components. Foundation, on the other hand, does not serve any purpose other than making your skin look and feel smooth by concealing blemishes. When it comes to consistency, BB cream has a lighter consistency than foundation. This means that when you use BB cream, you will not experience that “cakiness” you get from using foundation. It gives you a more natural and dewy look than foundation, whereas foundation has the tendency to give you that “made-up” look. In terms of coverage, however, the foundation provides a better coverage than BB cream. If you have deep discoloration and scars on your face, foundation does a better job in hiding them than BB cream. BB cream only provides light coverage whereas foundation offers full coverage. Lastly, BB cream is typically only for the face and is available in cream and stick form. It is best applied with the fingers. Also, there are only a few shades available due to the fact that it was mainly developed for East Asians. 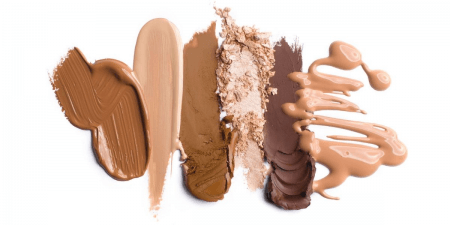 Conversely, foundation can be applied to the face and to the body (for models, actors, performers) and is available in cake, liquid, and stick form. It can be applied with a makeup sponge, brush, airbrush tool, or fingers. There are hundreds of foundation shades and formulas available.